Shrimp and Potato Croquettes (Bengali Style Shrimp Cutlet): Absolutely ‘melt-in-your-mouth’ croquettes/cutlets recipe that’s filled with a delicious mix of potatoes with shrimp. 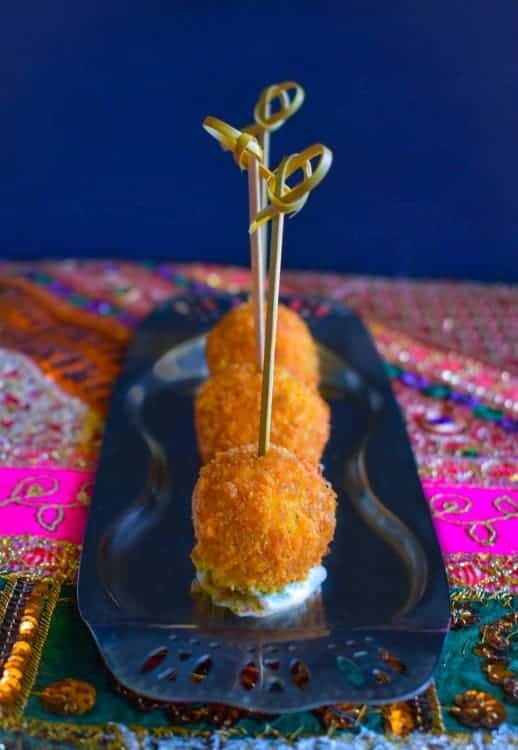 Shrimp and Potato Croquettes: also known as Bengali Style Shrimp Cutlet. It’s crispy on the outside and tastes even more delectable with a hot cup of tea. 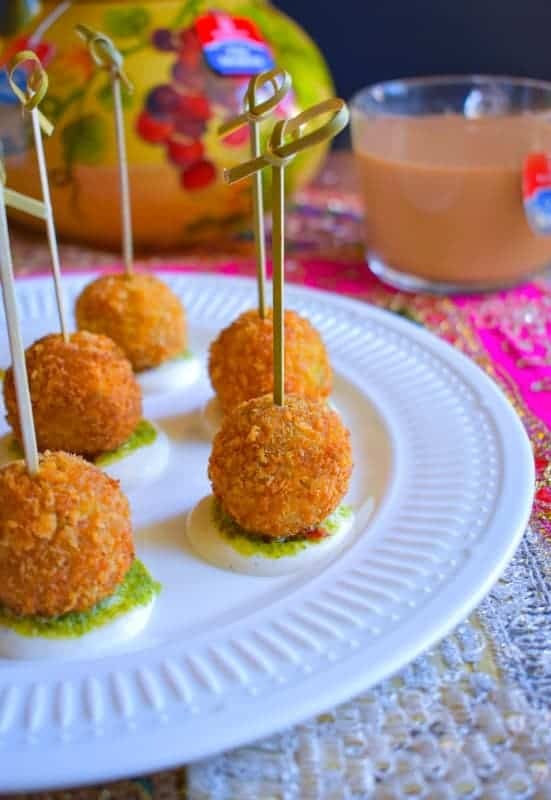 Hey Everyone, I’m back with another gameday recipe and this time, it’s Shrimp and Potato Croquettes (Bengali Style Shrimp Cutlet) that pairs perfectly with a high adrenaline game of cricket. Did you watch the ICC Champions Trophy Match between Ind vs Pak on June 04th? 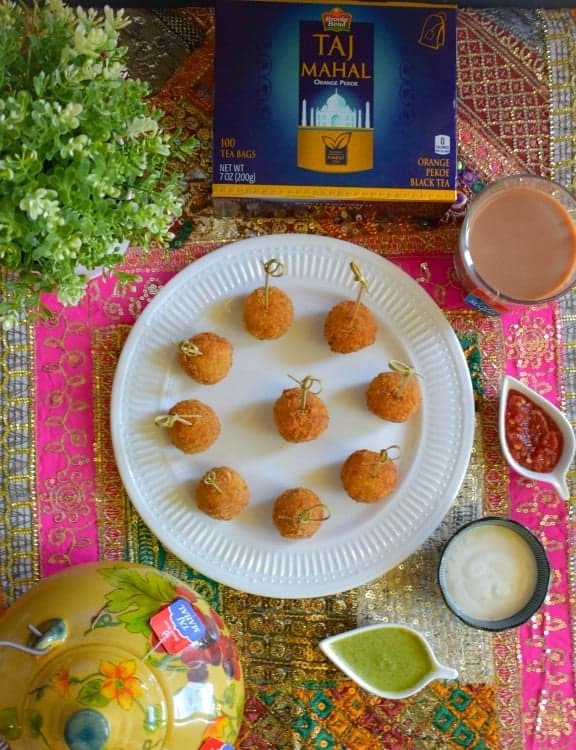 We had a fabulous get-together with our die-hard cricket friends and my ‘Stuffed Samosa Curry Buns’ along with hot piping Taj Mahal tea were an instant HIT !!!. I literally made 3 batches (each batch makes 16 buns) and not even crumbs were left….infact note to self for the next game (I should make and freeze some extra). So for the next match which is at our friend’s house, I’ve decided to make my hubby’s favorite Shrimp and Potato Croquettes (Bengali Style Shrimp Cutlet). His family is from Kolkata, India and they are very particular about their food (especially seafood & tea) and most importantly ‘Cricket’ ! Every ball, wicket, and shot is seriously discussed and I’d never seen as much passion and dedication over a game of cricket ….. Gosh, I’m so impressed and most definitely in awe!!! Hence, I thought what better way to relive those moments and make one of his favorite snack to share the same emotions and deliciousness with our friends this time. So, let’s discuss our croquettes, which is a mix of potatoes, shrimp, spices, that’s cooked together and then rolled in a batter and then shallow fried (less oil). The traditional recipe has lot many spices, chilies and usually fried in heaps of oil. However, I’m trying to keep them lighter (as I know they’ll be noshing on more than 2-3), hence, I’m not only shallow frying them but also baking some of them for our friends who don’t eat much fried food. 2. Place the croquette balls in a lined baking tray. 3. Spray each ball with cooking oil or brush them generously. 4. Bake for 12-15 minutes (turn them in-between and keep an eye). (The ones above are baked). 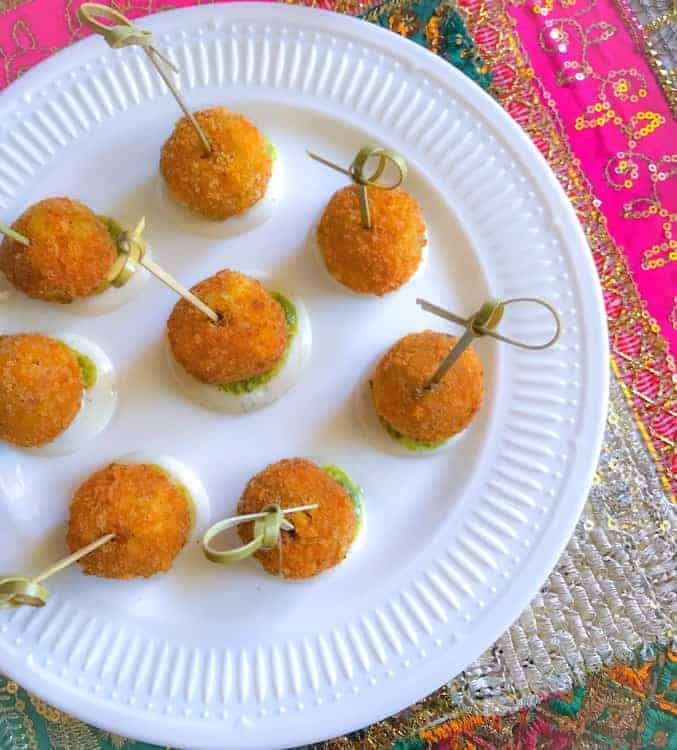 Also, this recipe of Shrimp and Potato Croquettes (Bengali Style Shrimp Cutlet) can be made in advance and can also be frozen for about a month. 1. Prepare the croquette balls. 2. If using a container, then line the bottom with a parchment paper or foil and place the balls over it (giving some space). The box can only have a single layer. 3. If using a ziplock bag, then just freeze the balls separately on a plate and then transfer the frozen balls into a ziplock. 4. Always ‘Date’ the frozen food so that you consume them within that particular time period. “fostering excellence to savor the best & exquisite flavor of the best tea leaves from the choicest gardens of Upper Assam”. 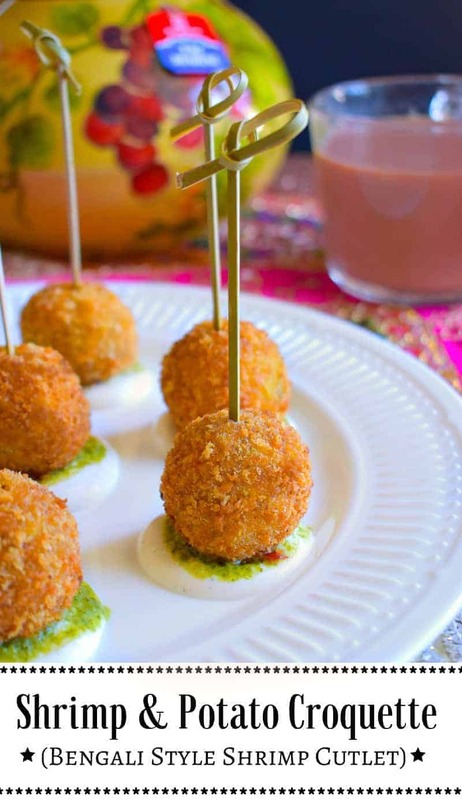 And go ahead and make these delicious Shrimp and Potato Croquettes (Bengali Style Shrimp Cutlet). Enjoy them with the upcoming game of cricket with a hot piping ‘ Taj Mahal ’ tea and don’t forget to say “Wah Taj”! Absolutely ‘melt-in-your-mouth’ croquettes/cutlets recipe that’s filled with a delicious mix of potatoes with shrimp. Add shrimp in a food processor and pulse to shred them slightly (till they resemble a crumb). Remove the shredded shrimp and keep aside. Grate the boiled potatoes and keep aside. Heat 2 Tbsp oil in a large non-stick pan. Add chopped onion and sauté till golden brown (takes 2 minutes). Add ginger+garlic paste and sauté for 2 more minutes. Now, add add the spices along with shredded shrimp and saute evenly. Cook this mixture for 3-4 minutes over low flame till onions are nice cooked. Finally, add the grated potatoes and saute everything evenly. Cook for another minute and turn off the heat. Transfer the mixture in a bowl and cool slightly. Once the mixture is cool to touch, form equal sized balls (I made 15). Keep the balls in a plate. Now, take one ball and roll it evenly in the flour coating all sides. 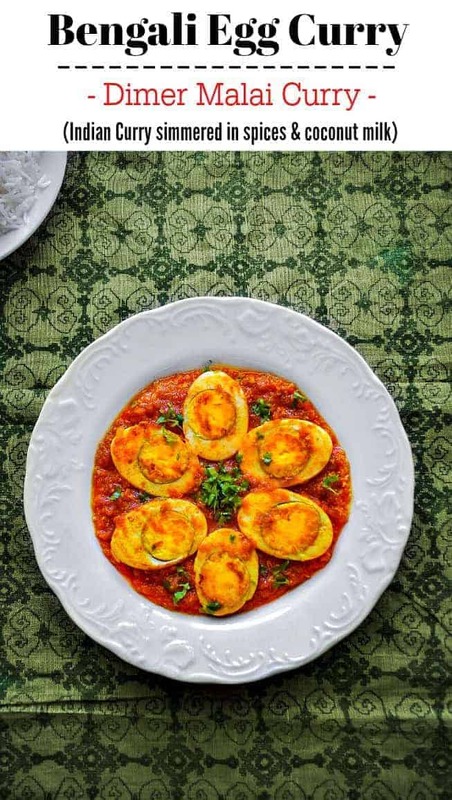 Place the coated ball in whisked egg bowl and evenly coat all sides with egg. Next, place the coated egg ball in the bread crumb mix and evenly coat all sides. 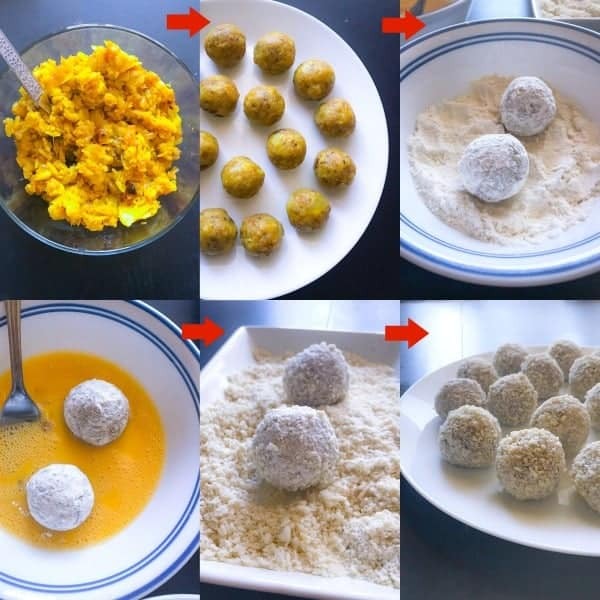 Place the bread crumb coated ball on a separate plate. Similarly, coat all the balls and keep aside. Heat 1 cup in a medium deep pan. (takes 2 minutes to heat properly). Turn the flames to medium and place 2-3 coated croquettes in it. Shallow fry the croquettes evenly or till a golden color is achieved. Remove the cooked croquettes from pan to a lined plate. Similarly, fry all the croquettes. Place the croquettes 2 inches apart on a lined baking tray or muffin pan. 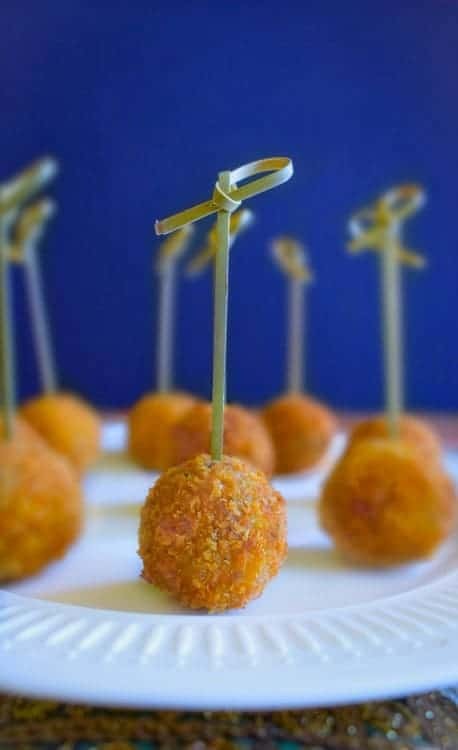 Spray each croquettes with cooking spray to lightly coat its surface with oil. Switch off the oven and turn the croquettes upside down and spray with oil again. (Please keep an eye on temperature an adjust accordingly to prevent burning of food). Transfer the cooked croquettes on a plate and serve with favorite dip. What’s more, if you’re around any of the following stores, you must go to pick up the ingredients for this recipe over the weekend! 1 Simple question, updated everyday, you can answer & participate everyday to increase your chances of winning! Definitely, check the dates near your city and make sure you visit the mentioned stores to win cool prizes or the sweepstake. 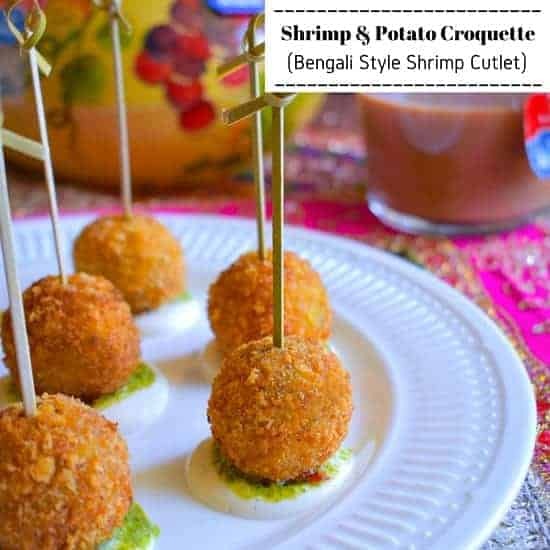 6 Replies to "Shrimp and Potato Croquettes (Bengali Style Shrimp Cutlet)"
I love croquettes of all kinds and the flavors in these sound out of this world! I love croquettes! These ones look delicious! These look like a perfect game day snack. Thank you for including instructions on how to bake these instead of frying!